Shakopee, Minn. – March 15, 2018 – Cyber Power Systems (USA), Inc., a leader in power protection and management products, has announced major updates to its PowerPanel® Personal software for its uninterruptible power supply (UPS) systems. The software allows users to automate unattended computer shutdowns and control and monitor the UPS with a USB or serial port. 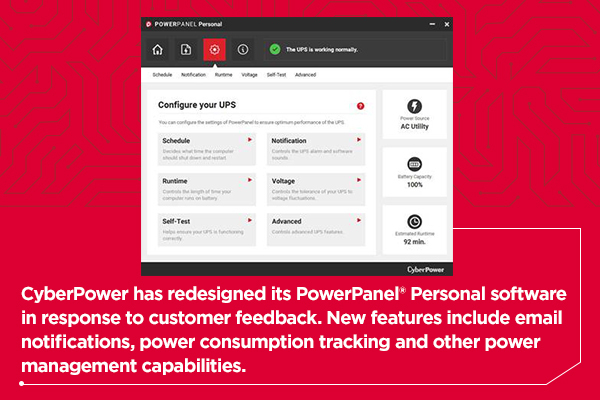 The new version of PowerPanel Personal features a modern design and added functionality to keep users informed of their UPS system and power events. Set-up email-based notifications to receive UPS system status messages and alerts to stay informed when power disturbances and disruptions occur. Record and track power consumption of the equipment connected to the UPS and equivalent CO2 emissions. Customize energy cost and CO2 equivalent emissions to track the cost of powering connected devices according to electric utility rates. Select type of automatic shutdown during power events: shutdown or hibernate. CyberPower PowerPanel Personal v2.0 is available as a free download at https://www.cyberpowersystems.com/products/software/power-panel-personal. The software is compatible with Windows operating systems. 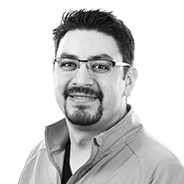 Later this year, the company will also release updates to its PowerPanel® Business Edition software supporting virtualized environments. About Cyber Power Systems (USA), Inc.
CyberPower designs and manufactures uninterruptible power supply systems, power distribution units, surge protectors, remote management hardware, power management software, mobile chargers and connectivity products. The company serves customers in enterprise, corporate, government, education, healthcare and small office/home office environments. CyberPower products are available through authorized distributors and sold by value-added resellers, system integrators, managed service providers, select retailers and online resellers. For more information, visit: https://www.cyberpowersystems.com/. Cyber Power Systems (USA), Inc.